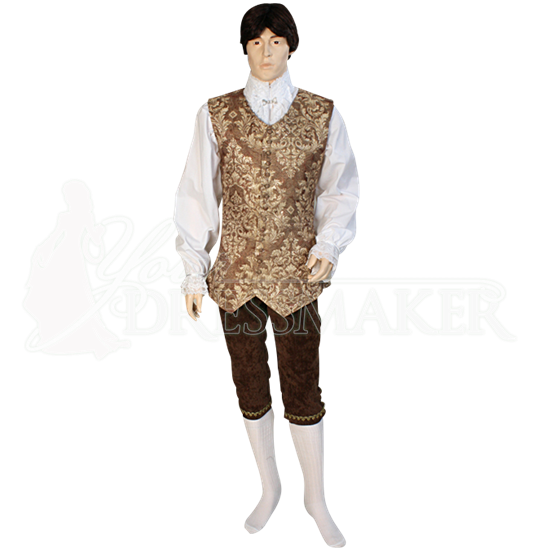 Displaying elegantly patterned brocade fabric throughout, the Mens Brocade Vest is a stunning way to add a touch of regal style to any period look. This handmade historic reenactment vest features a single breasted button closure. Drawing its inspiration from authentic historic styles from Baroque Renaissance fashion, the Mens Brocade Vest has a longer length, making it appropriate for Renaissance festivals, historic reenactment events, and more. Available in a selection of color combinations, the timeless charm of a vest makes it suitable for the outfits of fashionable Renaissance men as well as Baroque nobility.